The NBA draft combine has arrived. So how do prospects get ready for it? The Crossover asked former agent Matt Babcock to help navigate the pre-draft process. The Crossover presents a series of entries from former player agent, Matt Babcock. Over the remaining weeks leading up to the 2018 NBA Draft, he will provide a unique look behind the scenes of the draft process—offering a glimpse at how agents advise their players and maneuver the pre-draft landscape. Babcock’s second post details how agents approach the NBA Draft Combine, from deciding to have players compete in 5-on-5 live action to the series of team interviews that occur. We’re in the thick of it: the draft lottery is today and the combine begins tomorrow. As an agent you have done what is necessary for your player to be prepared. You have connected the dots with all of the teams and you have gathered invaluable information from these teams. Your player has done extensive interview, physical and on-court training the last month in preparation for the combine. We’re ready, let’s go! The NBA allows nine staff members from each team to attend the on-court sessions of the combine, 270 staff members in total. In most cases, the combine is the first time the top brass of each NBA team will see your player all together—needless to say, this is a big deal. In recent years, many general managers and team decision makers are spending more time with their own teams rather than aggressively scouting college prospects. I would assume every general manager in the NBA has a good grip of the players from Arizona, Duke and Michigan State this year. These schools have multiple draftable players including projected lottery picks Deandre Ayton, Marvin Bagley III, Wendell Carter Jr., Jaren Jackson Jr., and Miles Bridges. But how well does everyone know potential first-round picks like Chandler Hutchison from Boise State, Khyri Thomas from Creighton, and Landry Shamet from Wichita State? 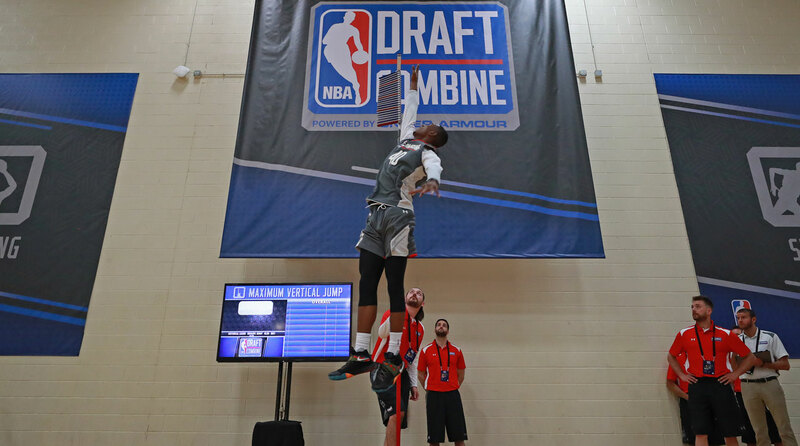 Sure, staff members who have roles that are primarily focused on scouting will know these players very well, but for most NBA teams, the combine is an opportunity for a staff to collaboratively establish their interest level in prospects. Another thing that should be noted is that the combine is likely the first time NBA head coaches are evaluating these players. Every team is structured differently; some coaches have decision-making authority with player personnel while other coaches have little to zero influence. Many times the head coach is the most qualified “basketball person” within the organization. However, coaches do not have the flexibility with their schedules to evaluate college prospects properly throughout the season—they are busy coaching their teams! The combine is the perfect opportunity to get exposure for your player on and off the court with the decision makers of every NBA team present. There is not a prerequisite for being drafted. For example, a player scoring a lot of points or grabbing a lot of rebounds at the combine does not necessarily translate to them moving up draft boards. And a player shooting the ball poorly on a specific day does not necessarily mean his draft stock will slip. I trust that team bosses like Danny Ainge, Magic Johnson and Pat Riley can evaluate talent properly even when players do not have their best performances in terms of scoring or making plays. Nevertheless, it is still possible for a player’s on court performance at the combine to affect his market value—both positively and negatively. Unfortunately, and for this reason, some agents will advise their players to sit out for the 5-on-5 portion of the combine in an effort to protect their player’s market value and to keep threats of injury at bay. As crazy as it sounds, this is not anything new. The NBA has tried different approaches to encourage full participation at the combine but players sitting out continues to be an issue. For example, the NBA extends conditional invitations to certain players contingent on their commitment to the 5-on-5 portion beforehand. Inevitably, some players will accept these invitations and still fake minor injuries before competitive play begins. My advice: Unless a player is completely comfortable with his projected draft status, he should play, without hesitation. Come draft day, a general manager is essentially asking his team owner to invest millions of dollars into a player by drafting them. 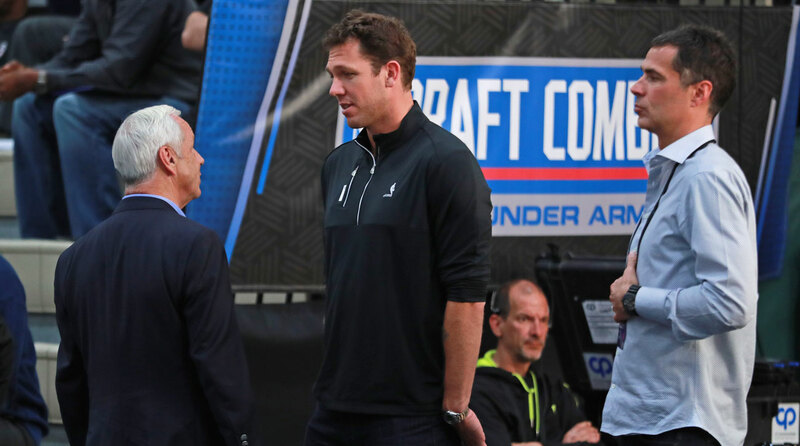 If I were a general manager, I would feel much more comfortable putting my neck on the line for a kid that has the guts to play at the combine and earn their spot in the NBA, rather than a player who is afraid of getting injured or underperforming. Players’ measurements will be taken and they will also be put through strength and agility testing while at the combine. The measurements charted will include: height, weight, wingspan, standing reach, hand size and body fat percentage. The strength and agility testing will include: vertical jump, bench press, a lane agility drill, and a ¾ court sprint. Most NBA personnel are experienced talent evaluators, their “eye test” is usually pretty accurate. The information gathered from these tests is not usually a substantial game changer. However, if a player measures and/or tests better or worse than expected it can affect a player’s market slightly. A key element of the draft combine is medical evaluations. Each player is put through a number of medical tests: blood work, EKG’s, MRI’s and x-ray's, to name a few. The results from these tests are made available to all thirty teams. The number one reason for a player to dramatically slip in the draft is due to medical concerns that come from these evaluations. Every NBA team has their own doctor(s) and some team doctors are more conservative than others. Many times, a general manager will not be given the freedom by their team’s owner to draft a player without the team doctor(s) having medically cleared that player first. Further medical evaluations are also done when a player visits teams for workouts following the draft combine. The team visits phase begins when the draft combine concludes on May 20 and will go until the draft on June 21. One month is not enough time to have a player visit many teams. If a player has any medical issues or does not attend the combine for whatever reason, it is important to be selective and schedule his team visits thoughtfully so he can be cleared medically by those teams prior to the draft. Agents are not allowed inside the combine, so once it finishes an agent will need to make his second round of calls to all thirty teams, prioritizing the teams that initially showed interest in their player. An agent will know which teams requested interviews with their player—obviously an interview request is a good indication of interest! The goal of these calls is to get a firmer grip of interest levels now that the teams have gathered new information on all of the players in the draft. • Which draft picks does the team have? • Which players are under contract on that team? • Which players are under contract at your player’s position on that team? • Are there team options or player options on these contracts? • Does the team have gaping holes in other positions that will likely need to be addressed? • How many available roster spots are available on the team? • Does the team have financial flexibility; are they under the projected salary cap? • Which contract exceptions does the team have available? • Is the team stable? Do the coaches and/or front office have job security? • Do you expect the team to be competitive next year? • Does your player fit the team’s specific style of play? • Would your player have an opportunity to play early on in his career with this team? I would systematically review each team and put myself in the shoes of each general manager and ask myself: What needs to be done here? Who and what does this team need to improve? I would use my personal team analysis and consider the information I have already gathered from the team’s front office staff. If done properly, the best options and possibilities will present themselves clearly and your priority list will take shape seamlessly. You will use this priority list to guide your player through the workout circuit phase of the draft process...hang tight because that comes next!